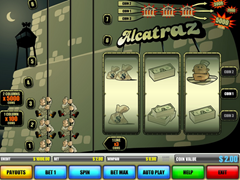 Alcatraz Pokie Review - Play Today! This fun pokie might not be able to shed light on the mysterious disappearance of the guards and prisoners that disappeared from Alcatraz, but it sure has the ability to turn the unfortunate events into a winning tale that fills your wallet. Don’t let the wealthy wins escape your pocket as the new pokie from B3W is rich with rewards. The game is offered on 3 reels with 3 wealthy paylines. An escape plan from the prison inspired the theme and the presentation is breathtaking. 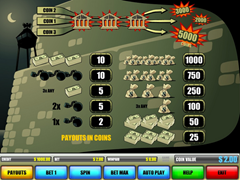 The jackpot offers 5,000 bonus coins and the 2nd highest wins rewards 3.000 coins. The game is a classic and will offer 3 lines for you to take advantage of. To activate all the lines you will need to increase the wager to 3 coins per spin. The coins hold a fixed value of $2.00. This means having all the lines active you will play the game with $6.00. This will give you more ways to win and bigger jackpot payouts. The reels is set to give players a view of the solid prison walls and reveals the prisoners sliding down the escape route during a dark night, to grab their hidden treasures and sail off to freedom. The winning reels is ready to offer huge wins that will set your dreams free. The symbols offers Fed Bank with white pillars, single stack of money, double stack of money, triple stack of cash, bag with $ sign filled with cash, two bags with $ signs and three bags filled with cash and an ankle chain with a heavy ball worn by dangerous criminals. The display tells a story of how the Fed bank not only offers the highest reward, but it also offers the chance to escape with the biggest wins. The pokie offers a great bonus game thats played to the left of the reels. Here you will see 3 bars with the escapees climbing up each time one of their symbols are displayed on either one of the reels. Each reel represents a bar and escapee. Fill one of the bars with criminals to win 100 coins, fill 2 bars at the same time and you will win 5,000 coins. The police will be notified when there are criminals on all 3 bars at the same time. The level of criminals will then drop my one and 3 coins will be rewarded. Again B3W surprises with a great unique theme brilliantly displayed to motivate incredible wins. The pokie offers a large variety of wealthy combinations. The fast spinning reels keeps the game super exciting and uncomplicated play offers players a chance to relax with high enjoyable wins. Don’t miss out on this opportunity to escape with high rewarding wins.